After months and months of work, we are so proud to unveil our brand new Austraflora website! 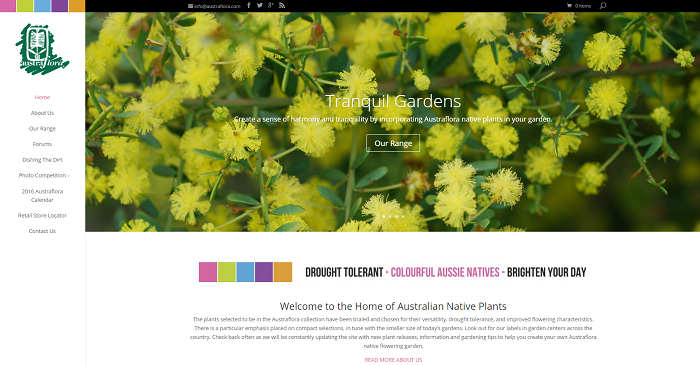 With a fresh and sleek new look and easy to use navigation, you’ll love browsing the site for all your much needed information and articles for everything native and Australian gardening related. On our front page you’ll find our plants are divided up into six new basic categories – Trees, Shrubs, Groundcovers, Grasses, Climbers and the much anticipated New Releases. From here you will find a showcase of photos and their corresponding plant. Each plant page contains a photo, information, a label image, and an option to download a PDF brochure. The brochures are especially handy for landscapers and gardeners who wish to print the information for portfolios, designs, and info on hand. Our Advanced Search allows you to search for your required plant on the basis of descriptive/growing information such as size, aspect, frost tolerance, and flower colour. You’ll find that the best matches appear, even if it is not everything you wish for. There will be lots of ways that you can access our Retail Store Locator, but the most direct is on the navigation menu. Simply enter in your postcode to find your nearest Austraflora retailer. Over time we will be updating our retailer list so that you have more options to track down the plants you love. One of our favourite features of the new Austraflora website is our articles page – “Dishing The Dirt”. Here you can find articles written by members of the Austraflora Team (as well as special guests) divided up into six categories – Design, Garden Health, Photography, Plant Spotlight, Products and Stories. There’s over 50 posts there already, and each week we will be adding more! There’s so much useful information, stories, tips and ideas. We hope that you enjoy reading! So spend some time exploring, and we hope that you love the new site as much as we do! Check back for the addition of new plants and articles, and keep in touch with us.